I have written briefly about Chop Chop in Morrison Street Edinburgh before but this was my first visit to the newer Chop Chop restaurant on Leith waterfront. 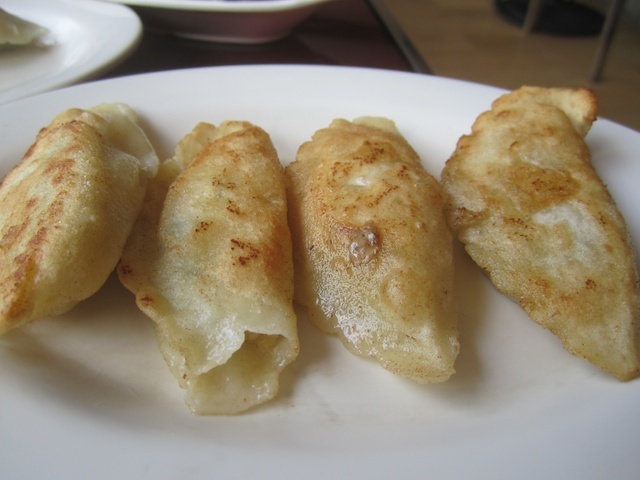 We went for Sunday lunch – our original intention was to have Dim Sum but when we saw the menu we were tempted by the banquet for four at £18.50 each – an opportunity to taste a wider selection of dishes. Click on the menu to see what was on offer – I won’t try and describe everything but will pick out some highlights. 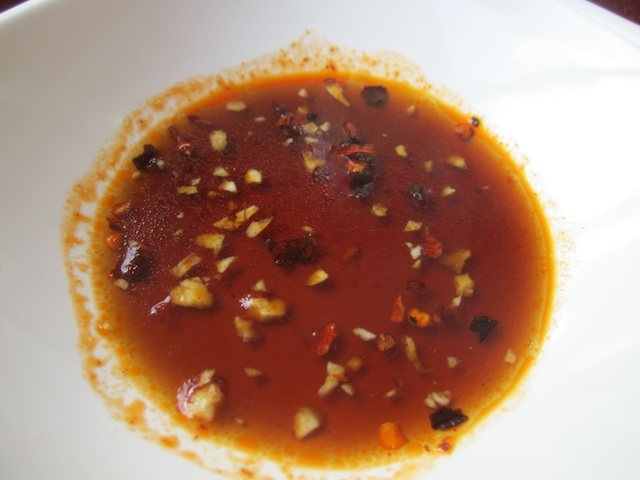 For the dumplings, you create your own dipping sauce from soy sauce, vinegar, garlic and chilli. 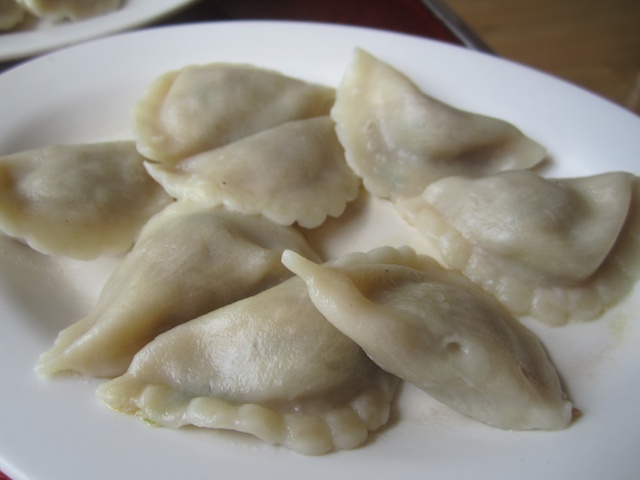 The boiled dumplings look a little flabby but tasted really good – the pork and coriander ones were outstanding. As were the fried prawn dumplings. 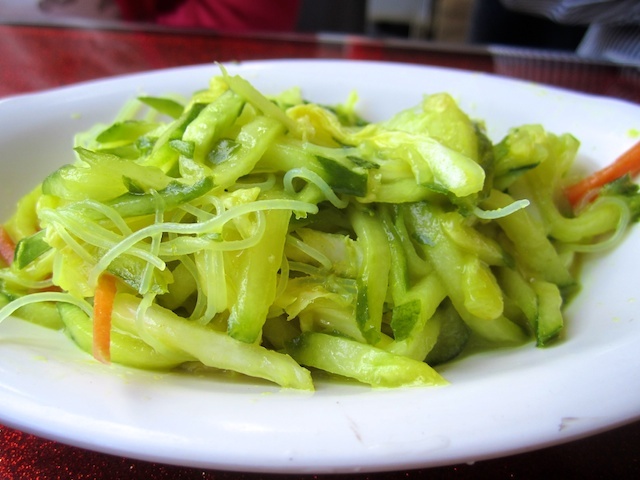 I never really associate salads with Chinese food and had no experience of Chinese salads. I was rather dubious about the potato salad which seemed to be raw potato but it worked really well, as did the cucumber salad. Aubergines with garlic were excellent – this is a Chop Chop signature dish and not to be missed. The crispy northern beef was good although I thought it was too sweet – the sauce would be better with quite a lot less sugar. 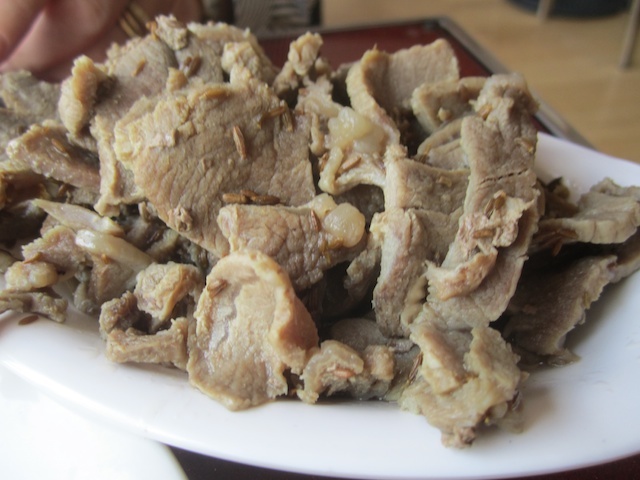 The lamb didn’t really look good – pale and watery – which put some people off. I think of cumin as a Middle eastern flavour with lamb – I’d never had it with Chinese food before and I thought it was very good. 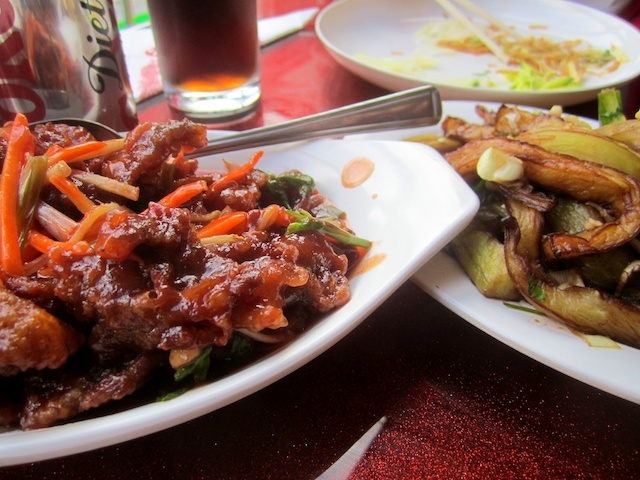 The stir-fried chicken and potato, however, both looked and tasted good. 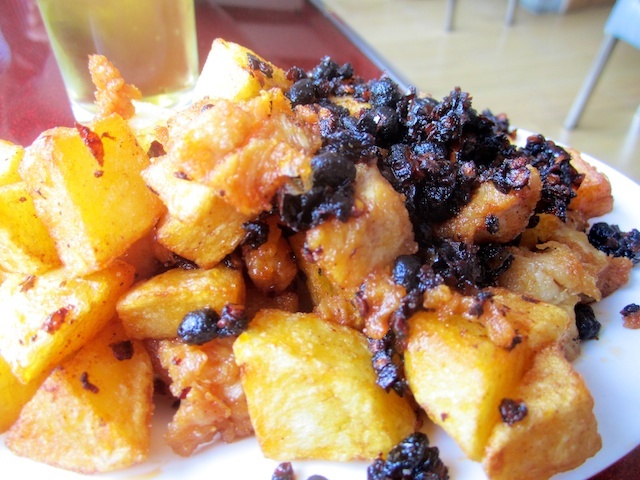 I’d never had experience of potato in Chinese cooking before. 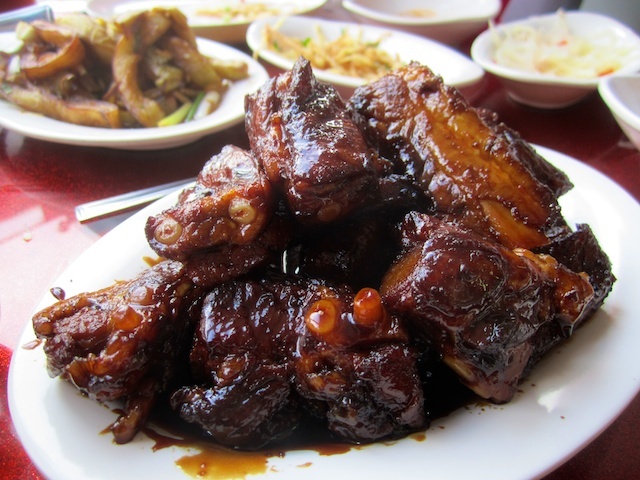 Sticky and superb sweet and sour pork ribs – sweet but that’s what you expect from this dish..
We don’t eat Chinese food often – my wife is diabetic and most Chinese dishes in the UK are too sugary. 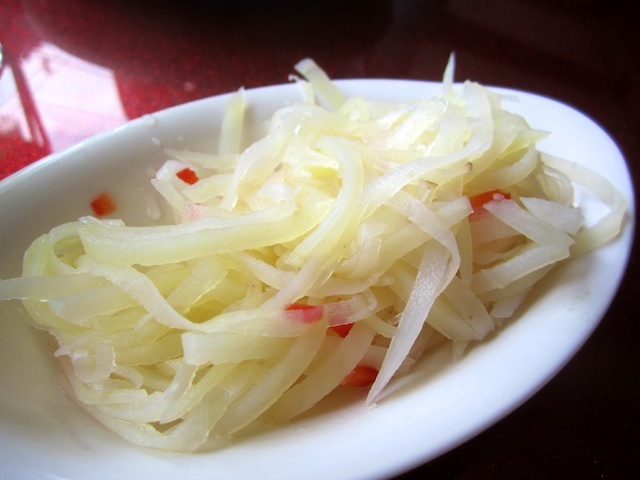 But Chop Chop is certainly different and definitely the best Chinese restaurant in Scotland that we have tried. It was not busy in Leith at Sunday lunchtime, which was a little surprising – we expected it to be full. But don’t let this put you off – great food and child-friendly. For the 2nd week running, we ate in Stonehaven. 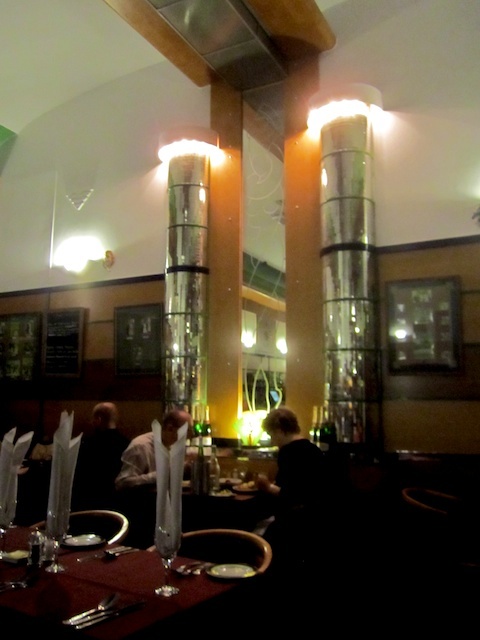 The Tolbooth last week and this week, the Carron – a remarkable Art Deco restaurant. Be careful not to mix this up with the other Carron Restaurant in Stonehaven – the fish and chip shop that invented the deep-fried Mars Bar. 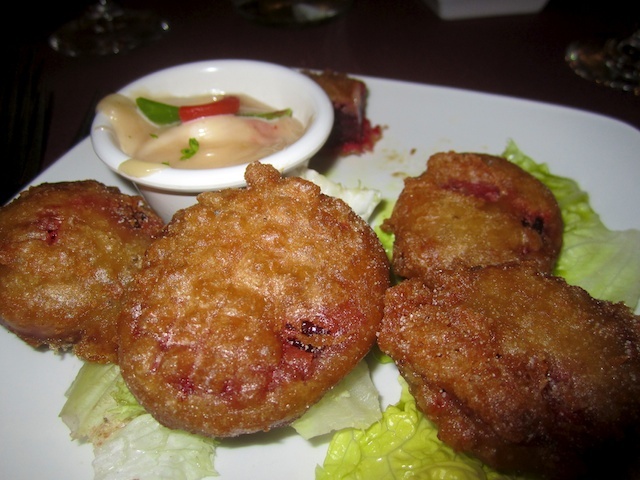 Reflecting Stonehaven’s deep-frying tradition, we started with an unusual deep-fried dish – Beetroot in Rosemary batter. It was absolutely delicious – very light batter and soft flavoursome beetroot. We had a little bit too much but took the leftovers home and reheated them for lunch the next day. Next course was local lobster. 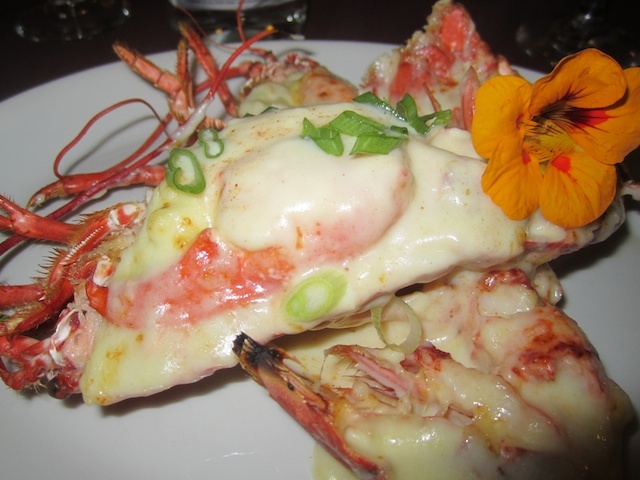 The menu was ‘Lobster Mornay’ – with a cheese sauce but the restaurant offered it plain with garlic and butter. I stuck with the menu choice which I think was a mistake – the sauce was rather cloying (and the nasturtium flower just pretentious). But the lobster was fresh and tasty – I think plain with butter would have been just right. No pudding – we were too full. The food in the Carron was very good – outstanding beetroot but overall perhaps the Tolbooth just has the edge. 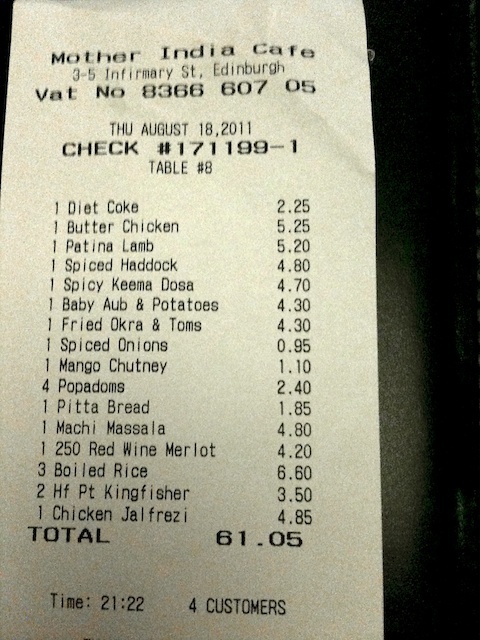 It’s a bit cheaper than the Tolbooth – even with expensive lobster, it worked out at just over £30 each. with a bottle of Picpoul de Pinet between 3 of us. The Tolbooth is a seafood restaurant on Stonehaven harbour. Our first visit was about 20 years ago – we’ve been back 2 or 3 times since then but not since 2009 (2009 review). The setting is wonderful and we had a great table by the window. 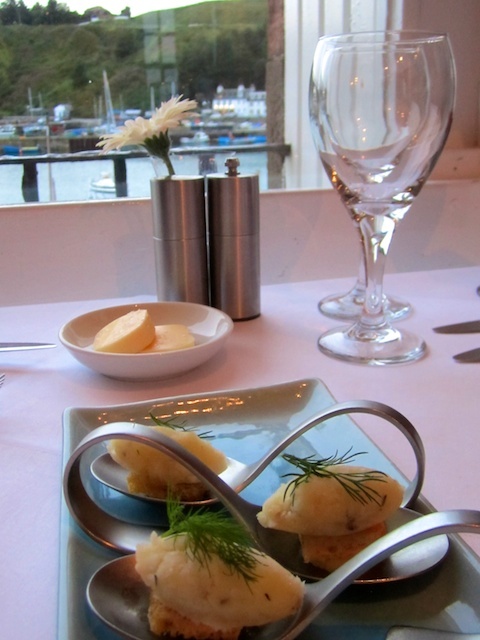 You can get an idea of the view from the picture of our amuse bouche (Brandade de Morue). 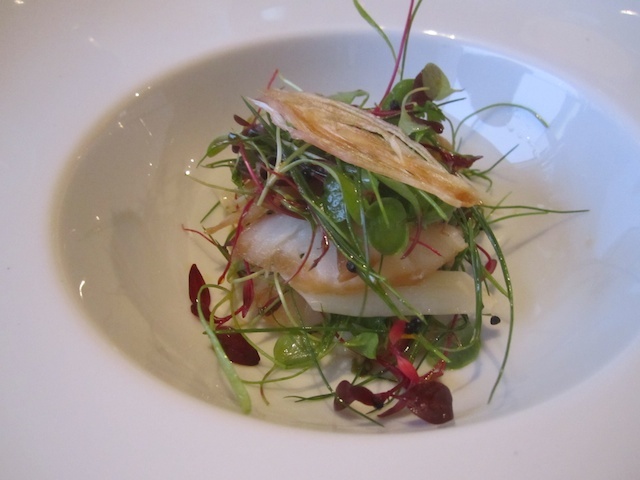 My starter was smoked monkfish with asparagus – other’s had sole and gravadlax. 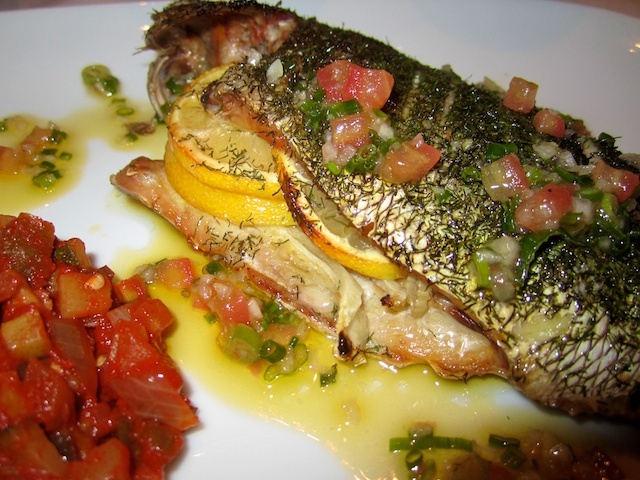 My main course was roasted sea bream with ratatouille. The fish was very nicely cooked but is inherently rather bony. By the time I had extracted the bones, it was a bit cold. Others made a better choice I think – they had hake with crab and lemon risotto. Dessert was outstanding. 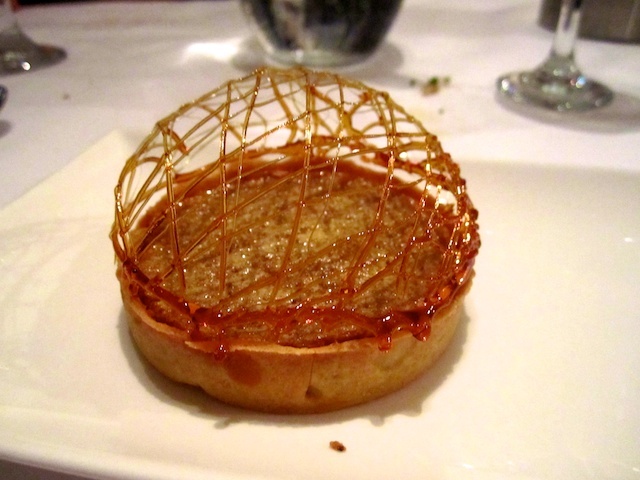 Treacle tart with clotted cream. Excellent meal. With a bottle of Muscadet sur lie, we were about £40 each – fish is expensive. Service was friendly and swift. Well worth a visit if you are in the area. 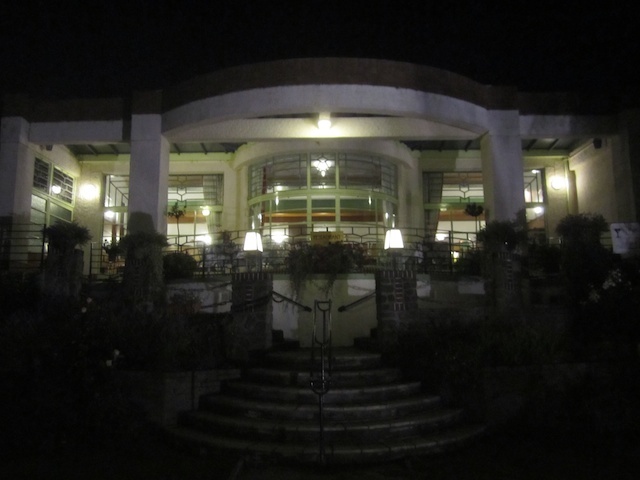 I’ve written about Mother India’s cafe before. We went there in August 2010, after wine tasting at the fringe. Now its becoming a habit. This year we had an evening of Portugese wine tasting followed by a curry at Mother India. The wine tasting is organised by Edinburgh Wine School and held in the City Chambers during the Fringe. We tasted 6 wines, 1 sparking, 2 white, 2 red and a dessert wine. Unfortunately, I have lost the wine list but perhaps the most memorable wine was a pink sparkling wine made by Cliff Richard (yes, Sir Cliff, Granny’s heart-throb) at his winery in the Algarve. It was really excellent, available from Waitrose and not particularly expensive. Overall, this is a great and instructive evening where you get to try wines that you would never normally have. Back to Mother India’s. 4 of us had 8 small dishes – you can see what we had from the photo below. The atmosphere in Mother India’s cafe is always great, food is good and always reliable. No booking but not usually too long to wait.